"They must be from California…" A24 has debuted another trailer for John Cameron Mitchell's adaptation of Neil Gaiman's How to Talk to Girls at Parties, even though we've seen a few international trailers previously. HtTtGaP is totally wacky cult sci-fi film that premiered at the Cannes Film Festival this summer to mixed reviews. The film stars Tony-winner Alex Sharp as Enn, a boy from the dreary London suburb of Croydon. Set in the late 70s, it's a punk rock-infused, horny-adventure about a group of punk kids who discover a secret convent of aliens visiting planet Earth. The cast includes Elle Fanning, Nicole Kidman, Ruth Wilson, Matt Lucas, and Tom Brooke. I did not care for this film at all, and while this is a good marketing push from A24, it's going to be forgotten, which is cool because it will be a cult classic even faster. You can watch the other UK trailer for How to Talk to Girls at Parties here, or the first international trailer. An alien touring the galaxy breaks away from her group and meets two young inhabitants of the most dangerous place in the universe: the London suburb of Croydon. 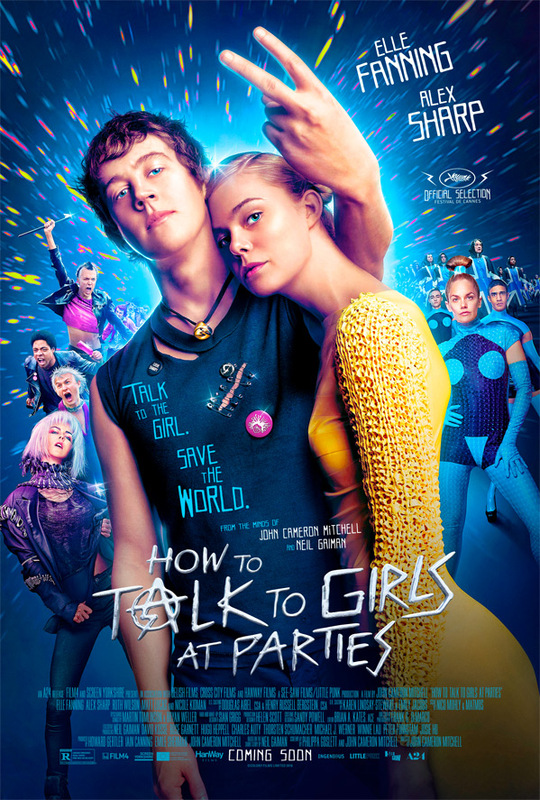 How to Talk to Girls at Parties is directed by American filmmaker John Cameron Mitchell, of the films Hedwig and the Angry Inch, Shortbus, and Rabbit Hole previously. The screenplay is co-written by Philippa Goslett & John Cameron Mitchell; adapted from Neil Gaiman's short story of the same name (Gaiman also executive produced the film). This originally premiered at the Cannes Film Festival last year in the Midnight category. How to Talk to Girls at Parties opened in Europe already last fall. A24 will be releasing the film in US theaters, but currently only has it set for "This Summer" - stay tuned for an exact release date from them. Anyone still interested in this or no?